Electro-Bond 02 is an electrically conducting silver-filled epoxy compound recommended for electroni..
Electro-Bond 02LP is Long Pot Life Curing, electrically conducting silver-filled epoxy compound reco..
Electro-Bond 04 is a single component, heat curing, conductive epoxy polymer that was designed for e..
Electro-Bond 61 is an epoxy adhesive and coating formulation based on conductive carbon . Electro-Bo..
Electro-Bond 13 is two parts epoxy high formulations for bonding and coating electronics parts . 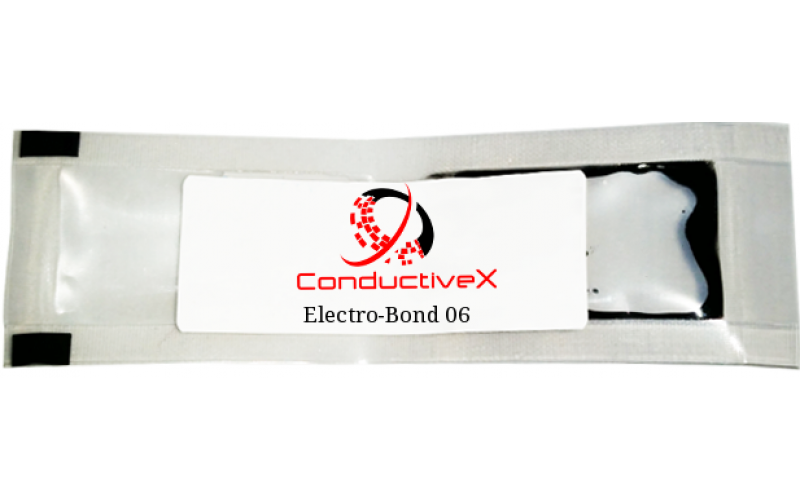 E..
Electro-Bond 06 represents the newest technology since the introduction of electrically conductive silver compounds. This unique formulation is based on a silver coated ceramic that results in lower material costs without adversely sacrificingthe properties obtained with a pure silver formulation. This concept opens the door to a wide range of applications previously prohibited by the much higher cost of conventional silver conductive. Electro-Bond 06 cures at room tem perature or can be accelerated with mild heat to form a tenacious bond between similar anddissimilar substrates such as aluminum, copper, magnesium, steel, bronze nickel, ceramic, glass, phenolic, and G-10 epoxy glass boards. because of its excellent continuity, has been used extensively in such diversified applications as, microwave EMI and RFI shielding, in the assembly or repair of printed circuit boards, wave guides, electronic modules, flat cable, high frequency shields, connections, and circuitry and as a cold solder. 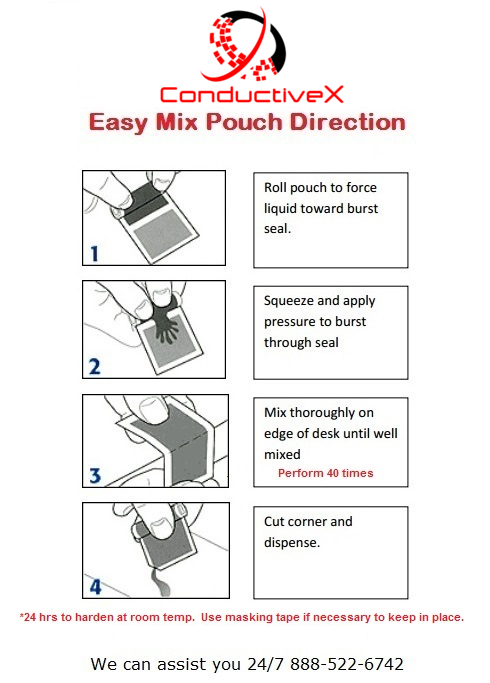 This unique formulation offers ease in handling due to its creamy consistency and versatile application by hand, automatic dispenser, silk-screening, transfer or stamping techniques. " For high strength application, electrical properties, perfect bond, cold solder for heat sensitive components. Electro-Bond G2 represents the newest technology since the introduction of electrically conductive s..
Electro-Bond 03 is an epoxy adhesive and coating formulation based on Nickel. 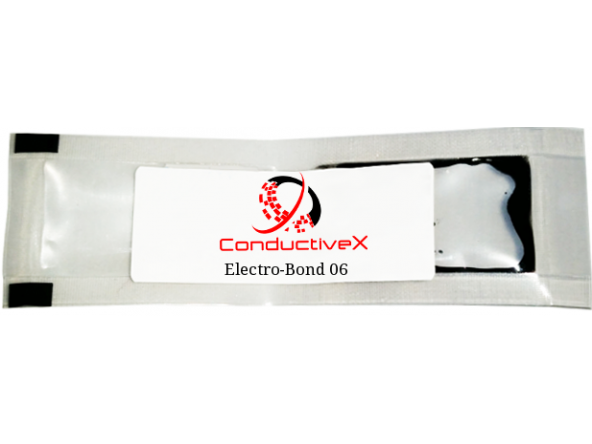 This epoxy nickel form..
Electro-Bond 01 is a single component epoxy, formulated with pure silver powder combined with organ..
Electro-Bond 16 is an electrically conductive, silver-filled epoxy formulation recommended for elect.. Doing business in an honest and fair manner with our customers means we must earn their business based on competitive pricing, the quality of our products and services, and our ability to fulfill our contractual commitments. Copyright © 2016, ConductiveX, All Rights Reserved.